Bach's St. Matthew Passion is universally acknowledged to be one of the world's supreme musical masterpieces, yet in the years after Bach's death it was forgotten by all but a small number of his pupils and admirers. The public rediscovered it in 1829, when Felix Mendelssohn conducted the work before a glittering audience of Berlin artists and intellectuals, Prussian royals, and civic notables. The concert soon became the stuff of legend, sparking a revival of interest in and performance of Bach that has continued to this day.Mendelssohn's performance gave rise to the notion that recovering and performing Bach's music was somehow "national work." In 1865 Wagner would claim that Bach embodied "the history of the German spirit's inmost life." That the man most responsible for the revival of a masterwork of German Protestant culture was himself a converted Jew struck contemporaries as less remarkable than it does us today-a statement that embraces both the great achievements and the disasters of 150 years of German history.In this book, Celia Applegate asks why this particular performance crystallized the hitherto inchoate notion that music was central to Germans' collective identity. She begins with a wonderfully readable reconstruction of the performance itself and then moves back in time to pull apart the various cultural strands that would come together that afternoon in the Singakademie. The author investigates the role played by intellectuals, journalists, and amateur musicians (she is one herself) in developing the notion that Germans were "the people of music." Applegate assesses the impact on music's cultural place of the renewal of German Protestantism, historicism, the mania for collecting and restoring, and romanticism. In her conclusion, she looks at the subsequent careers of her protagonists and the lasting reverberations of the 1829 performance itself. "Bach in Berlin is a wonderful piece of scholarship from a leading historian of German national identity.... It is not so much an account of the revival itself, but instead an examination of how educated Germans (the Bildungsburgertum) learned to view music as a fundamental component of German culture and how they saw Bach, especially in his vocal music, as the epitome of German music: serious, profound, religious. Applegate tells the story brilliantly, traversing disciplinary boundaries with virtuosic ease.... Stunningly original, well-written, and judicious in its handling of historical and musicological controversies, Bach in Berlin is an engaging, first-rate book that should be on the reading list of anyone with interests in nineteenth-century music and German history." "Applegate brings together the personnel and circumstances around an event famous in all music history books. Her confident handling of written sources reveals Berlin as a burgeoning city of culture and, let us not forget, military power, both of which were to impinge so radically on Europe that all kinds of historians will find much of interest in Bach in Berlin. I particularly appreciated the excerpts from the day's musical journals, pleased to see that, for example, Bach's recitative was already admired by the discriminating." "Exemplary.... Applegate arranges her material elegantly around an account of the 1829 performance itself, supported by a detailed examination of the circumstances in which it took shape, and discusses how these illuminate an emerging German culture.... The story of the revival of the St. Matthew Passion is people by vivid characters. Among the principals are Mendelssohn, Schinkel and Goethe, supported by Zelter and Fasch and the actor Eduard Devrient, but the evocation of place and period is made more lively by Applegate's fascination with the coteries surrounding them." "It is easy to enjoy Applegate's fascinating and flawlessly written book, which abounds in colorful prose and into which a myriad of well-chosen and superbly translated quotations are woven. Every page is engaging." 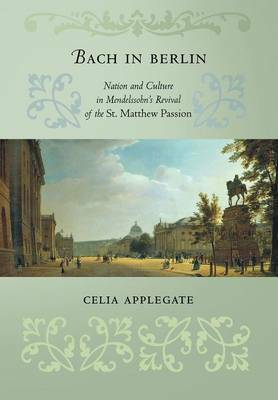 "Celia Applegate's enthralling book is a major contribution not just to the reception of Bach but also to our understanding of the formation of German national identity."